ISIS is currently producing a book on South Africa’s former nuclear weapons program, scheduled for publication in 2001, and conducting other projects focused on South Africa’s former program. 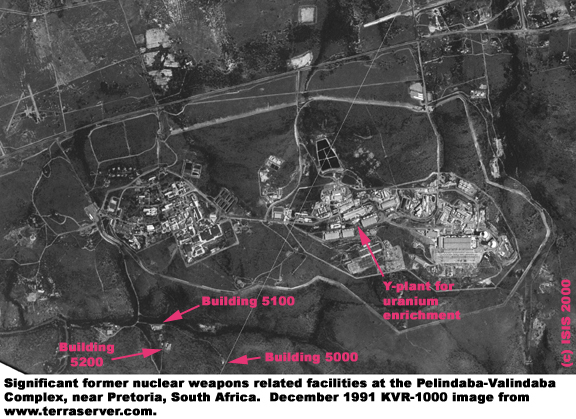 Related to this effort, ISIS has been acquiring and analyzing satellite imagery of important sites in South Africa’s former nuclear weapons complex. More thorough information will be provided at a later date. 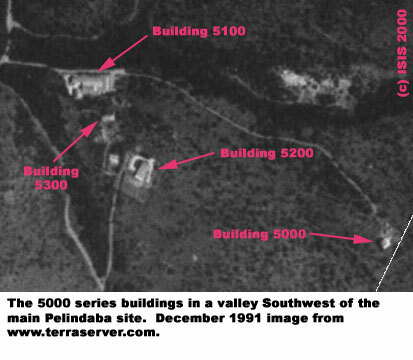 p> Public sources contain much information about the history of the Pelindaba and Valindaba sites (see, for example, A.R. Nuwby-Fraser, Chain Reaction (Pretoria: Atomic Energy Board, 1979). While the two sites are geographically adjacent, they have distinct and important histories. For example, South Africa created the Valindaba site in 1970 for the Y-plant that was to be built by the newly founded Uranium Enrichment Corporation of South Africa, Ltd. (UCOR). Pelindaba was founded in the 1960s and was operated by the Atomic Energy Board. In more recent times, facilities at both sites have come under the control of the Atomic Energy Corporation, and most have been shut down. p> We have annotated a KVR-1000 image (purchased from Terraserver) of Pelindaba and Valindaba. The resolution of the image is approximately 2-meters. The date of the image is December 30,1991. 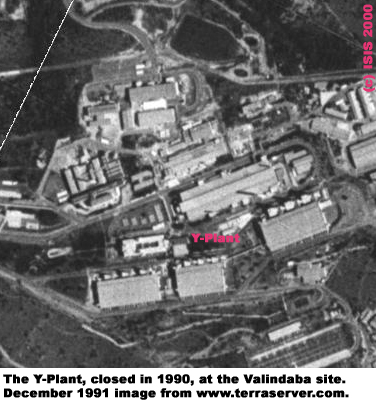 The most important nuclear weapons-related facility at the old Valindaba site was the Y-plant, where highly enriched uranium was produced for both civil activities and nuclear weapons. p> Building 5000 - This facility contained a pulse reactor for the experimental verification of theoretical computer models. In 1979, the reactor was used as a fast critical assembly in an experiment often referred to as “tickling the tail of the dragon” that proved the design of the gun-type device. The reactor was never used as a pulse reactor and the facility was shut down in the early 1980s. p> Building 5100 - This building contained the control room for Building 5000, offices, research and development laboratories and machining facilities for uranium metal. After the nuclear weapons program was transferred to ARMSCOR in 1979, the building continued to house the program’s small theoretical group until 1989.
p> Building 5200 - This building housed a critical facility to verify separately the multiplication factors of the two parts of a nuclear explosive device, providing confidence that the gun-type design would work. The first nuclear explosive device was also assembled in this building. p> Building 5300 - This building was designed exclusively as a laboratory for high explosives. In the early stage of the South African nuclear weapons program, small quantities of high explosives were pressed and machined into shapes at this facility.